tony.latham wrote: I have not played with this, but you can run your own wind tunnel tests online. It's free. I'd make sure you upload a photo that includes your tow vehicle. Let us know what your pickup on. Thanks for sharing the URL link to this online software, Tony. I hadn't heard of Flow Illustrator, and it has piqued my interest. I guess what I'm trying to say - and you probably already know this Tony, but not everyone will - is that any free (heck, even a lot of expensive) software won't be able to do much besides compare overall shapes. As one poster pointed out, merely rounding the corners can have an incredible effect on efficiency. Just look at the design of any windshield wiper, mirror, door handle or headlight on an automobile! I don't know if Flow Illustrator can deal with the complexities introduced by the trailer traveling within the turbulent airflow created by the tow vehicle, either. So, to the OP, this sort of a software is a great tool! But don't expect it to give real-world answers. But hopefully, it'll point you in the right direction. Nor will it pick up on the hurricane hinge. You say hurricane hinge, I say wickerbill or Gurney Flap! Here's a cool image from a paper that relates to those tail extension fairings. It's very readable; I only spotted one mathematical formula, a basic expression of the aerodynamic drag force. You can get a good feel for vehicle aerodynamics from the paper. Without becoming an aerodynamics expert we can see the practical solutions by looking at products in the marketplace. 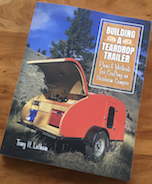 Nobody bothers to streamline a travel trailer more than an Airstream or a teardrop. Boats and aircraft get even more streamlined because it pays off for them. But not for road vehicles. I've worked with aero-engineers who use Navier-Stokes equation solvers to analyze fluid flow problems. It's one of the most difficult numerical computation problems and, to do it for real, takes the power of a super computer. I hate to disappoint, but agree with Andrew. This is an interesting way of making fun looking pictures, but, as the creators say on the web site, it isn't intended to be used for analyzing real world effects. First, it is a two dimensional version of an analysis that has to be done in three dimensions (which requires much more computation than can be done on a personal computer). Then, a large part of using these sorts of tools correctly is setting the grid size fine enough to capture the effects you are looking for, but not so fine that the computer never reaches a solution. That's where engineering expertise and experience comes in. Sounds like the intent of the people who did the web site (besides allowing the creation of pretty pictures) is to give students a chance to try (2D) Navier-Stokes equations. The research I have done I have come to the conclusion to do your best from what you can gather then it's all wind tunnel testing to see what happens. Just too many variables and the real thing is cheaper easier and faster than an iffy simulation. I will say that using our Sorento to tow the 5x10 utility trailer empty It was getting 30 mpg going from Fort Worth to Wichita,ks cruising 80-85(not bad for a 290hp 6 cyl SUV). Coming back I had to have the ramp vertical due to the load(light and short but awkward). I got an average of 17mpg on the trip home and much of that was way under the speed limit at around 60 ish and finding the odd slow truck to draft behind. Needles to say the trip home took much much longer and was very frustrating not keeping up with traffic. I could just fine but at the expense of really guzzling gas. If I had a tools I would have cut that ramp off and left it on the side of the road. The morons builders put a hinge on backwards so you can't remove it. Need to fix that as well as build a two piece hinged ramp. The basics are easy to know and use. - Any taper you can get at the back end helps - the traditional teardrop is tapered greatly top-to-bottom, but is straight side-to-side. If you do those basic things you get most of the aerodynamic improvements that are practical. After that you are pursuing the last one or two percentage points of drag improvements. Here's my answer to the problem! Kinda shaped like a Bowlus in back. Still finishing it, so I really don't have any numbers yet. Richard, do you have a build thread for that beauty? No. Lost most of the pics when I went for a little swim with the grandkids (Hey, whats this cell phone doing in my pocket? DOH!). There's a few pics on here with my profile. I like to build wood boats. This is basically an upside-down boat. Richrad wrote: I like to build wood boats. This is basically an upside-down boat. So how is this trailer built? It almost looks like a canvas skin over a wood skeleton. Richrad wrote: Here's my answer to the problem! Kinda shaped like a Bowlus in back. Still finishing it, so I really don't have any numbers yet. It looks to me like the aerodynamics on your rig are about as good as can be done and still be practical to keep some usable space inside. Nicely rounded front corners; tail tapers gradually both vertically and horizontally. Did you cover the underside of the floor to make that smooth too? I built it in a canoe process called “glued lapstrake”. Basically you build a form, then bend long strips of 6mm plywood over it. Each strip is epoxied to the last one as you go. Then pop it off the form. I didn’t fill underneath since the frame is only 2x2” tube..
OK, so...how about a photo tour? Fun thread! To quote AguyfromOhio "Without becoming an aerodynamics expert we can see the practical solutions by looking at products in the marketplace." There is a reason all SUV's look alike nowadays, and most minivans, because the profile of the vehicles are the best compromise of interior room with aerodynamics. And yeah, when you're on a primitive road going 25mph (maybe!) or cruising around town at 45mph, it's a moot point. However, hurtling down the road at 65-75mph, it makes a LOT of difference. Case in point when I make my annual trip to Kansas City to visit relatives. The first day is spent going over two mountain ranges (Wolf Creek Pass and La Veta Pass) in my 2014 Dodge Grand Caravan. The entire first day is above a mile in elevation, probably average 7000 feet. The grades are about 6% or so. My mileage is usually about 25-26mpg for the day (no trailer on these trips) The second day is traversing part of eastern Colorado and all of Kansas, pretty flat, but a much lower elevation, starting out around 3500 feet elevation and ending up at about 900 feet elevation in Kansas City, MO. My mileage that day averages maybe 22mpg. So just the fact that I'm driving through denser air, even though I'm not going up and down mountain ranges, reduces my mileage about 15%. But to the point, rounded edges are better, and again, the taper towards the ground in the back seems to be helpful as opposed to a square back end. All depends on what you're doing. A short jaunt to a campground doesn't really matter, it's the driving all day at freeway speeds where it may be more critical (if that's what you usually do to get to where the party is!). My first post, haven't figured out all the "cool stuff" like pictures yet, LOL! I was unaware of the Bowlus so I looked it up. Very cool indeed. I love this photo of a Bowlus Road Chief being towed by a Tatra 87.